The broadest purpose of a building designed in the intuitive way is to be. Today every aspect of a building is for or about something else. What he says about architecture also applies to art and design, and living. The book is wide-ranging and possibly not for those who like arguments laid out in a linear fashion. I had a great time accompanying Jonathan Hale as he brought together Andrew Jackson, Thomas Jefferson, Thoreau, Emerson, Betty Edwards and Drawing On the Right Side of the Brain, Le Corbusier, Frank Lloyd Wright, and the Post Modernists. An extra treat was that he used Newburyport, where I live, as an example of architecture built with the old way of seeing. The grammar of shape is innately understood. Unlike speech, it is visible in plants and animals everywhere. The intuitive design process gives access to that knowledge. You do not work at design; you play at it. Wishing us all a spirit of play in our work. PS. 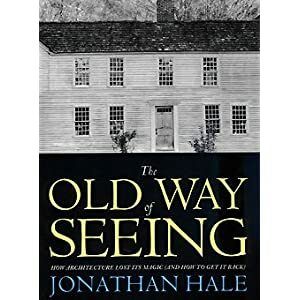 Sadly The Old Way of Seeing is out of print.